Designed to deliver innovative ways of serving its members, Dupaco Community Credit Union’s newest branch opened Aug. 15. The public is invited to a ribbon cutting ceremony and open house at the San Marnan Learning Lab, located at 1946 Schukei Road in Waterloo, on Wednesday, September 28, from 4:00 p.m. to 6:00 p.m., with the ribbon cutting ceremony at 4:30 p.m. The full-service branch provides members convenient access to credit union services. 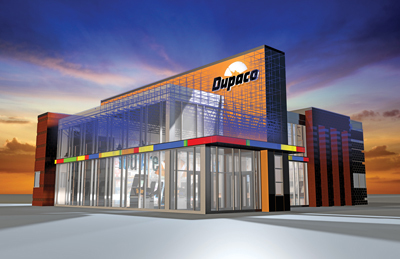 Modeled after the Dupaco Learning Lab in Peosta, Iowa, which opened last year, the newest branch is equipped to explore and test new ways of helping members understand money and find financial solutions. Video teller kiosks operated by remote Dupaco staff for full-service transactions. A collaboration station to explore money matters with on-site staff. Free personalized financial coaching sessions through Money Makeovers and Credit History Lessons. Technology tables to experiment with mobile deposit, set up eNotifiers or learn about mobile payments. While the branch is new, Dupaco’s methodology remains the same—delivering personalized financial advice to improve its members’ financial position.